I found these three lizards basking on the heavily eroded limestone rocks known as tsingy, I wasn't sure at first if they were skinks or Zonosaurus, and our naturalist guide John didn't recognize them. When I studied the photographs later, I realized they were definitely Zonosaurus based on the large scales in a regular grid-like pattern, the smooth "helmet", and the fold down the side, among other distinguishing characteristics. But I couldn't figure out which species of Zonosaurus it was. Glaw and Vences only show Z. haraldmeieri at Ankarana. I could find only a few photos of that species, but it's described as almost identical to Z. madagascariensis, and the photos I found corroborated that. 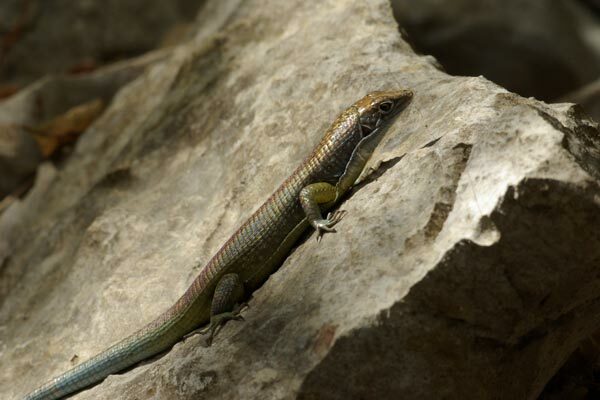 But these lizards are quite different than Z. madagascariensis. The other two photos I initially found were these ones from Bill Love's Blue Chameleon Ventures site. 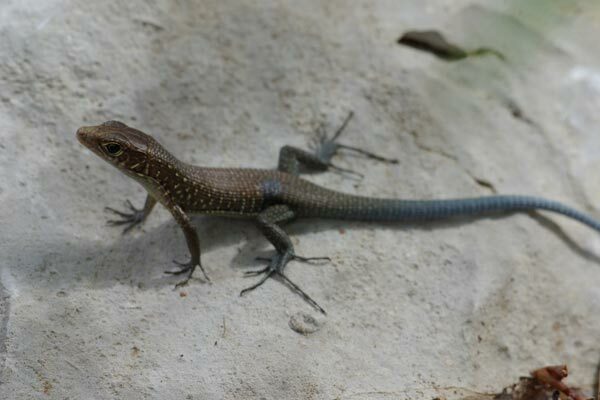 These show a bright blue lizard, with text explaining that other specimens are even brighter blue. So I came away with the impression that Zonosaurus tsingy is bright blue, whereas the lizards I had seen had iridescent sheens and pale blue tails, but were certainly not bright blue. But I remained unconvinced that the lizards I had seen were Z. haraldmeieri, and a few weeks after my initial attempt to find photos of this species I Googled like mad, and this time I hit the jackpot: a PDF issue of Yale Environmental News that included a photograph of the individual Zonosaurus tsingy lizard that was used to describe the species, a.k.a. the holotype. 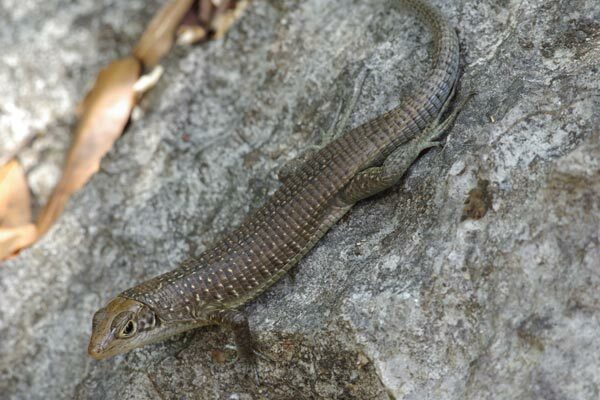 And how about that, it looks precisely like the lizards I saw, pale blue tail and all. So I'm now confident that I've identified these lizards correctly, and I assume that the bright blue individuals shown and described on the Blue Chameleon Ventures site are probably males in full breeding season plumage.